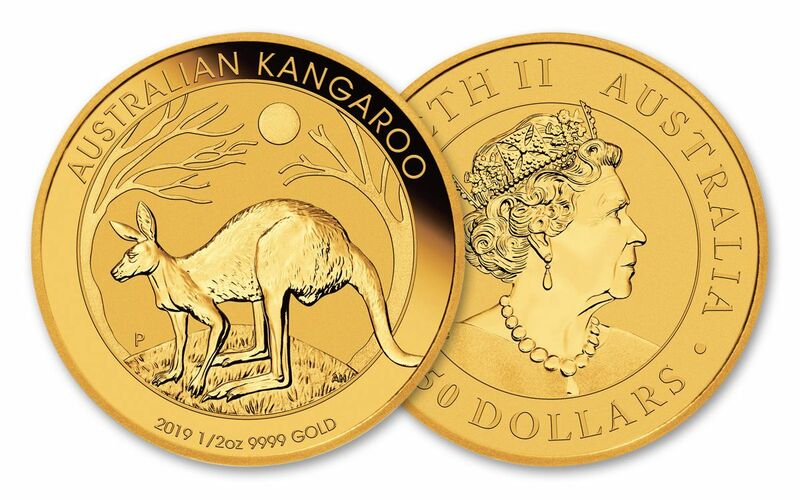 Straight from the world-renowned Perth Mint on the West Coast of Australia, the 2019 Gold Kangaroo has arrived! This gorgeous coin continues the Australian Kangaroo series’ decades-long tradition of combining high precious metal purity with stunningly detailed design. For collectors and goldbugs alike, this 2019 bullion coin has exactly what you want! A NEW DESIGN FOR AN ICONIC STANDARD – The 2019 Gold Kangaroo premiers a new one-year-only design. On the coin’s reverse is a solitary kangaroo perched atop a tiny mound with the sun rising in the background between two barren trees artfully curving to fit the outer edges of the design. The coin’s title, year, weight and purity – along with the Perth Mint's “P” mintmark – are also on full display. BEAUTIFULLY CRAFTED, HIGHLY PURE GOLD – As you can tell, this bullion is anything but boring! The artisans at the Perth Mint take extraordinary care in transforming half-ounce planchets of 99.99% pure gold into works of lustrous art. 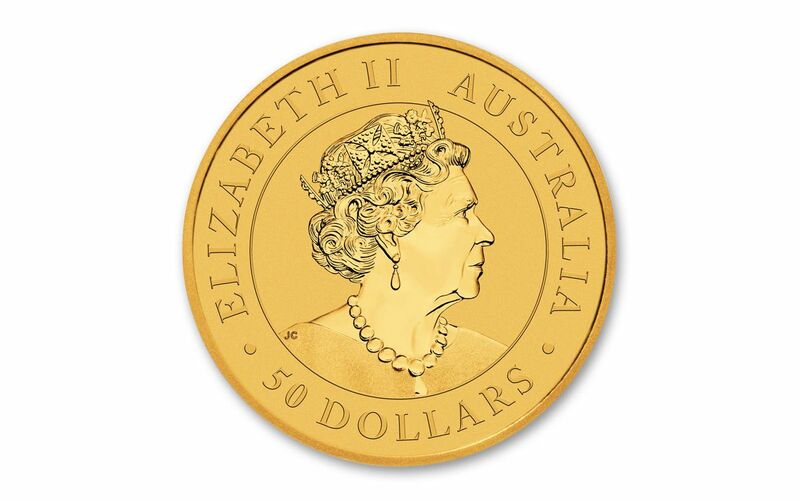 AUSTRALIA LEGAL TENDEER – Each 2019 Half-Ounce Gold Kangaroo is 50 dollars Australia legal tender, a fact exhibited on each coin’s obverse along with Jody Clark’s new portrait of Her Majesty Queen Elizabeth II – the sixth portrait of the current monarch to appear on Australian coins. 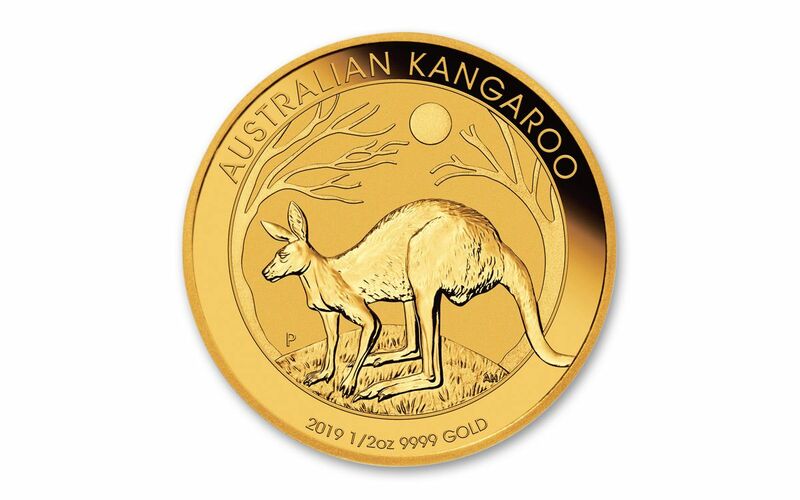 BRILLIANT UNCIRCULATED CONDITION – Your 2019 Gold Kangaroo will arrive in Brilliant Uncirculated (BU) condition, exactly as it left the Perth Mint, in a protective acrylic capsule. NEW SECURITY FEATURE – Australia’s 2019 Gold Kangaroo coins also feature a new security feature – a micro laser-engraved letter “A” concealed within the reverse inscription that is visible only though a magnifying glass. For gold buyers and collectors around the world, the arrival of each year's Australian Kangaroo is consistently met with high demand. Whether you're new to the series or a longtime fan, this 2019 edition is one not to miss. Don't wait another moment – get yours now!